Two boys cited for illegal burning, reckless endangering after playing with lighter. 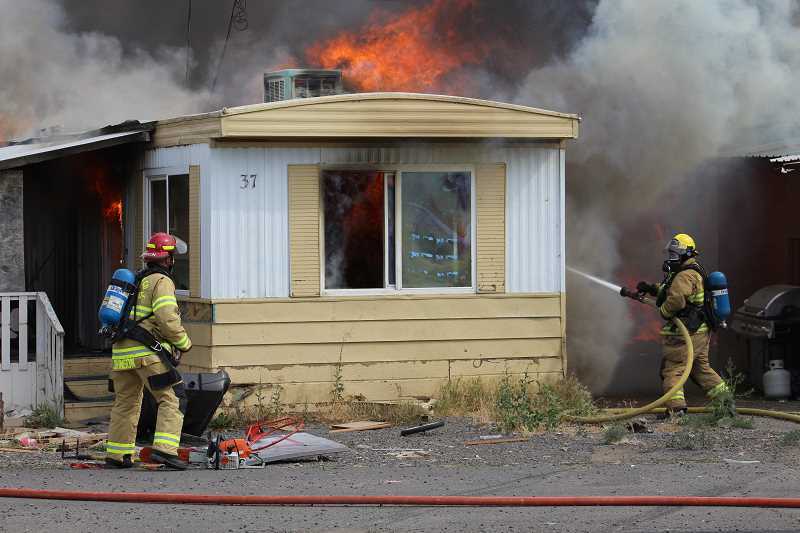 Two young boys who were playing with a lighter at Tops Trailer Park last week were accused of starting a fire July 31, which burned four trailers, and displaced at least 15 people. The boys, ages 10 and 7, who live in nearby trailers, were issued citations for illegal burning and reckless endangering, and released to their parents, according to Jefferson County Sheriff Jim Adkins. "It scared them; they said it got away from them," said Adkins, noting that the report on the incident has been turned over to the Jefferson County District Attorney's Office. The fire was reported to the Jefferson County Fire Department at 3:57 p.m., when the temperature was around 100 degrees. "It definitely was very hot that day to be fighting fire," said Capt. Kasey Skaar. The fire department responded with four staff members, nine volunteers, a command vehicle and four fire trucks. "People were getting somewhat dehydrated," he said. "For fires like that, and the temperatures, and being in heavy gear, it definitely makes it exhausting." Upon arrival, the fire department found a shed fully involved next to unit 39, Skaar said. From there, it spread to unit 37, adjacent to 39, and to 38, behind 39. "Unit 36 started to ignite, but we were able to knock that down." The fire also burned fencing between the west side of the park, visible from Depot Road, and the east side of the park. Brigitte Morsman, who owns Tops Trailer Park with her husband, Phil, said that unit 39 was owned by Yazmine Rodriguez and George Ortega, who have five children, all of whom weren't home at the time. "(The fire) jumped over the fence and got 38," she said, noting that Tiara Williams and Pedro Orozco and their two young children lived there, and made it out safely. Unit 37, owned by Mary Zane, was empty, and unit 36, owned by Joshua Gibons, who has three children, was damaged beyond repair. "Thirty-six was home, but made it out, too." The American Red Cross — Cascade Region responded around 6 p.m. and provided resources to help address the immediate basic needs of those affected, such as temporary housing, food, clothing, comfort kits with toiletry items, information about recovery services, and health and mental health services. The Red Cross reported that six adults and 10 children were affected by the fire. The fire department was on the scene until about 7:30 p.m. The residences were valued at about $10,000 each, with contents also valued at about $10,000 each. Counting the four trailers burned last week, 10 trailers have burned in the past five years. Earlier this year, a fire destroyed a single-wide trailer at the park on Feb. 16. Two more were burned on April 14, 2017, one on Dec. 19, 2013, and two more Aug. 17, 2013. Morsman said that there are currently 31 units, down from a high of about 60 units.